There was no winner of the lotto jackpot of €5,800. In the lucky dip €20 went to Mai Kennedy, Saint Benildus Avenue; Catherine McLoone, The Abbey; Caroline Patton, Lower Creevy; Gregory Sweeney, Tullyhorkey; and Murt Cullen Cluain Barron. Following a fine win over Buncrana, Aodh Ruadh were brought back to earth with a bump on Sunday. After scorching out into a 1-3 to no score lead against Killybegs, the Fishermen reeled the visitors back in to lead at the break. They preserved their lead over the second half to run out 2-12 to 1-9 victors. There was less between the sides in the reserve game, but Killybegs still ran out winners, 0-12 to 2-2 the final score there. It's a double-header weekend ahead for senior and reserves. On Good Friday Saint Naul's are the guests in Father Tierney Park. The reserves get things going at 5pm and are followed by the seniors at 6.30pm. Then on Easter Sunday Aodh Ruadh travel to Ardara. The reserves throw-in at 1.30pm with the seniors going off at 3pm. It's early days, but these double header weekends can have a big say in the final league table so come out and support the team. Championship takes centre stage at under 16 level now. Aodh Ruadh have two big games in quick succession. The first is against Termon this Wednesday at 6.45pm in Father Tierney Park. A good vocal showing of Ballyshannon support would be much appreciated for that one. Then on Easter Monday the team are down to travel to Carndonagh for a 6.45pm throw-in. The under 12s are in action this Friday at 6.30pm against Four Masters. Players to be at the Park for 5.45pm. Commiserations to Donegal, Cian Rooney and Kyle Murray on narrow defeat to Derry in the Buncrana Cup Ulster final. Killybegs traveled south to Father Tierney Park on a cold and blustery Sunday morning for the latest round of the Ladies Football Division 2 Shield South competition. It was 13-a-side as Killybegs had the bare minimum, but that didn't stop them dominating the first 15 minutes. They looked like they were in for a goal three minutes in, but a great stop from Orlaith Gillespie who was in nets for the day denied them. As the game moved into the second quarter the visitors lead 0-5 to no score. Aodh Ruadh finally got off the mark with two successive points from Áine Gilmore and Elaine Dorrian. Then with ten minutes to go to the break a foul on 21 metre line was brought forward to the 13. Killybegs took their free quickly and hit the net. In the last few minutes of the first half the sides swapped scores, but it was the visitors who lead 0-3 to 1-7 at the turnaround. After a hectic first half the second was a bit of a slow burner. Aodh Ruadh had three changes and Killybegs lost a player through injury. The first few scores went the way of Killybegs and then with Aodh Ruadh breaking through a strong defensive screen Elaine Dorrian scored a fine goal to make it 1-3 to 1-10. However, three minutes later Killybegs struck back with a goal of their own to keep them arm's length from the chasing Ballyshannon side. The full time score was Aodh Ruadh 1-5 Killybegs 2-11. Best for Aodh Ruadh was Orlaith Gillespie in goals who pulled off some great saves. Up front Anna Rafferty, Mary Flora Scott and Áine Gilmore who covered every blade of grass. The team's next outing is the long trip to take on Saint Michael's in Dunfanaghy on Easter Monday. Senior and minor ladies training continues on Wednesday at 7.30pm. The under 16 girls had a good run out against Derrygonnelly on Monday evening. In defence Dearbhla Hughes-O'Brien was very strong, Niamh Hughes did some good work around the middle of the pitch and up front Katie McMullin and Laoise Kelly were good outlets. Training resumes on Easter Monday. The under 14s played Letterkenny Gaels away last Tuesday. Despite a big effort from all the girls, we met a very good and well drilled Letterkenny side and they ran out winners in the end. We were ahead by a point with 10 minutes to go, but the hosts rallied back and their determination together with a match winning performance from their free taker saw them take the victory and the points. Aodh Ruadh are at home for our third game in the league this Tuesday with a 5.30pm throw-in against Moville in Father Tierney Park. All support would be greatly welcomed. If the first round of the under 12 mini league was played in glorious conditions the second was played in a rather less favourable set of meteorological circumstances. Once again we had two really well contested games. The Jaguars needed two late Pearl McHugh points to get the better of the Pumas. Meanwhile the Tigers prevailed against the Lions after an entertaining clash. As things stand the Tigers are on four points, the Loins and Jaguars are on two points and the Pumas are yet to get off the mark. This Saturday at 4pm is the last of the group games with the Tigers v Jaguars and Pumas v Lions. If there is a tie in places after the round robin, we will resolve it with a free kick competition. The third Saturday we will play finals and do presentations. Training as usual this Wednesday at 7pm in Páirc Aoidh Ruaidh. Training for under 10s continues this Wednesday from 6pm to 7pm at Páirc Aoidh Ruaidh [Munday's field]. Under 8 girls training continues this Wednesday at 5.45pm in Páirc Aoidh Ruaidh [Munday's field]. A reminder that there will be no under 6 girls training on Good Friday. Good luck to Megan Kane and the under 14 Donegal girls on Saturday when they contest the Ulster final on Saturday against Armagh in Lurgan. Aodh Ruadh returned to competitive adult hurling in fine style with a convincing 4-17 to 1-6 win over Omagh Saint Enda's on Friday evening. The team will be looking to continue their good run of form in the Junior Hurling League going when they make the trip to Inishowen this Easter Saturday to take on Carndonagh. Throw-in down it Carn is at 6.30pm. Last Thursday saw our minors claim their first win of the season after a great battle with Burt in Father Tierney Park. Victories over Burt are rare for Aodh Ruadh and this was one to be savoured as our young team ran out winners on a 3-16 to 2-8 scoreline. The lads have another tough game this Thursday at home to a strong Setanta team. The under 14s traveled to Ballybofey and had a comfortable victory over MacCumhaill's. Thanks to the parents who drove the lads to the game. The under 14s have a busy week ahead. On Tuesday they are at home to neighbours Four Masters and on Thursday they head for Letterkenny to take on table toppers Saint Eunan's. Underage hurling training continues on Sunday for all teams at 12 noon. There is a Texas Hold 'em Poker night in McGinley's bar on Good Friday at 9pm Tickets are €30 with buy backs and top ups available. There is also a raffle on the night with mega prizes to be won. Booked games for the coming week are as follows. Aodh Ruadh are hosting our annual Easter Camp from this Tuesday to Thursday 18th April. Camp runs from 10am to 2.30pm on each of the three days. The camp costs €30 per child and €50 for two children. For further information and bookings call Brian Roper on 087-6139065. This annual Park Committee table quiz takes place in Owen Roe's this Holy Thursday. There has been a lot of refurbishment works at our club buildings over the past few months and this is an important fund-raiser to meet some of the costs involved. As there is daily use of our facilities by hundreds of players across all codes in the club, this is an opportunity to help meet costs by putting in a team of four. It is always a good night as we get a lot of people coming back for Easter. Please confirm participation ASAP by texting David McLoone, Tom Daly or Conal Gallagher. Last week's €400 bingo jackpot was won by Sarah O’Shea. The stand up game prize of €120 was won by Regina Dolan. House winners included Molly Kerrigan, Margaret Meehan, Angela Gaye, Teresa Campbell, Julie Kane, Mary B Kerrigan and Monica Quinn. There was no winner of the spring snowball so it rolls to €375 this week. We’ll have our Easter Bingo this Good Friday at 9pm with an Easter Egg give away during the night! Books priced just €10. 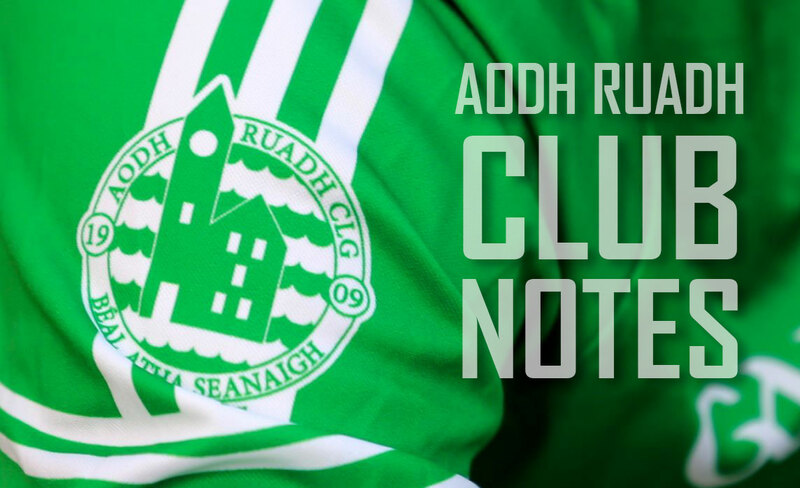 Read more in the club notes archive.